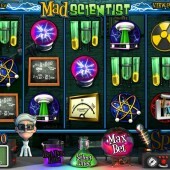 Innovative slot developer Betsoft Gaming have taken a trip into science fact with their attractive Mad Scientist slot. A 3D video slot with 5 reels and 20 paylines, this does break the mould of more recent Betsoft offerings in that it has a Wild icon – here the blackboard symbol. Substituting for all regular symbols other than the bonus Scatters, it jostles for space on a packed reels with potions, test tubes, amp meters, danger signs, microscopes, a Tesla coil, power switches and an atomic sign. The theme is clear from the very start and there's plenty to get involved in on this slot with an array of symbols that pay out throughout the game. There are more Wilds to be had in the ‘Wild o’Cution’ feature, triggered by hitting the Tesla coil icon on Reels 1 and 5. The coils will activate, ‘shocking’ symbols in between them into becoming Wilds. When a winning combo hits on the reels, the squares crackle with electricity in a nice little animated move. Meanwhile, our silver-haired scientist (here looking a lot like Colonel Saunders) cheers on when you win cash. Coin bets range from $0.02 to $1.00, with a max. bet of $100 available. There’s even a nice little counter for your win on the last spin to help you keep track. The 5,000-coin jackpot is a nice draw – here paid out for hitting five electricity balls on the reels. There are bonuses galore in this game, in true Betsoft fashion. Three Scattered test tubes on the reels anywhere triggers a second-screen Great Experiment bonus round, where you have to help our mad scientist – or should that be alchemist – turn various items into gold. Select any four of the items and if they successfully make gold you’ll win cash. Get three or more nuclear symbols in a row from left or from right and you’ll activate the Bio Pick Me round. An instant-win bonus, you can win up to 175 coins if you hit the right symbols. 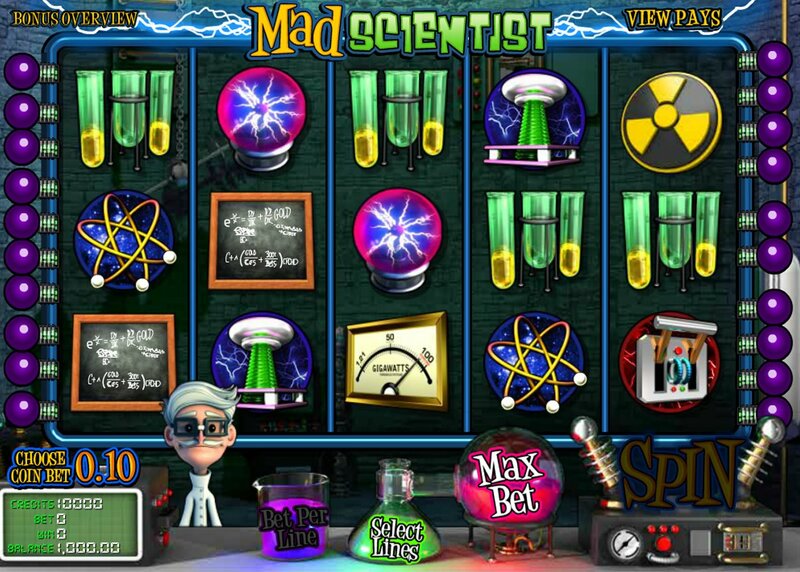 Betsoft do like to cram their video slots with features, and there’s no doubt mad Scientist has plenty of them. I would have liked to have seen some variety, however. Two essentially Instant Win features aren’t amazingly great, and the Tesla Coil Wild feature – the game’s most exciting addition – is too hard to hit. With only 20 pay-lines I would stick to some of Betsoft’s more visually-attractive 3D games like their America-themed slot, Gold Diggers, or indeed the sequel to this game from the same developer: Madder Scientist.